The true studio classic, but not only popular amongst professionals -For decades now, professional users all around the world have placed their trust in our classic range: DT 770/880/990 PRO. These benchmark-setting studio headphones, boast extremely detailed resolution and very transparent sound. The true studio classic, but not only popular amongst professionals -For decades now, professional users all around the world have placed their trust in our classic range: DT 770/880/990 PRO. These benchmark-setting studio headphones, available in three different models, boast extremely detailed resolution and very transparent sound. The DT 990 PRO headphones is the range’s open-back model offering impressive spaciousness. 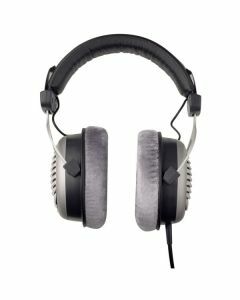 The DT 990 Edition headphones for use at home and the DT 990 PRO studio headphones: Soundwise, both models are identical as they feature identically designed acoustic transducers. There are fundamentally two differences between the models. Firstly, the Edition models have a softer headband for enjoying music at home whereas the PRO headset has a slightly firmer fit. Secondly, the Edition models come equipped with a straight cable whereas the PRO models come with a coiled cable.